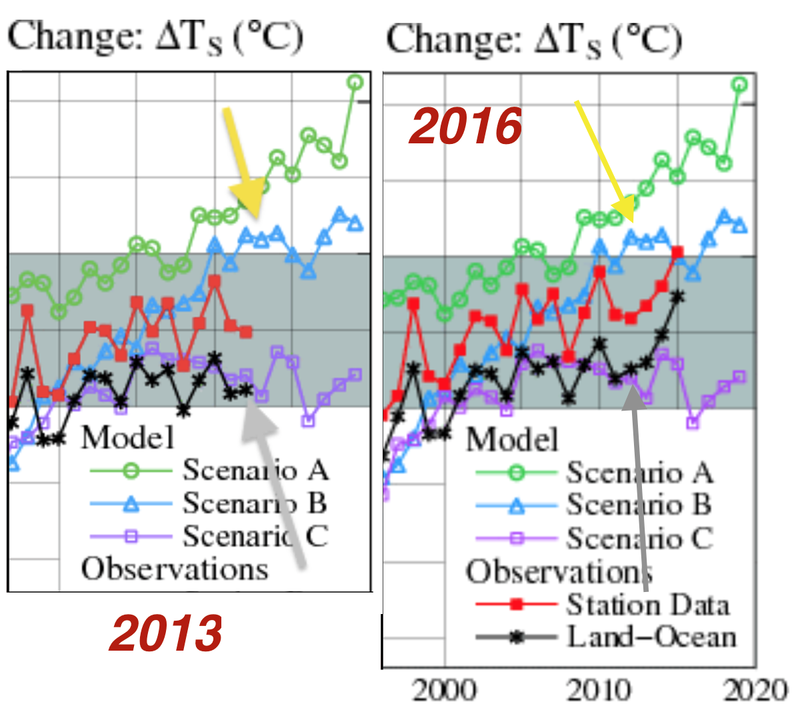 There is nothing mysterious about using the gap between models and observations at the end of the period as a measure of differing trends. That Secretariat was a very fast horse is about all you can get universal agreement with climate scientists in the field of metrics. When it comes to measurements of the earth's temperature, which, of course, is their field, the actual data is often tweaked until it agrees with their global warming hypothesis (the exact opposite of how science should be conducted; more on that topic here). Unfortunately, I have two new examples of climate scientists moving the goalposts from the back of the end zone to the 12-yard line. Let's begin with a discovery I made over at NASA's climate website. It shows Dr. James Hansen's (the father of the global warming movement) famous 1988 forecast of how earth's temperatures would evolve over future decades given three "scenarios" pertaining to how the amount of carbon dioxide (CO2) changed. The short explanation is that Scenario A (green) assumed the amount of CO2 continued to rapidly increase, Scenario C was if CO2 increase was curtailed and B was in between. In other words, the purpose of the graph was to show how good (or bad) Hansen's forecast was. 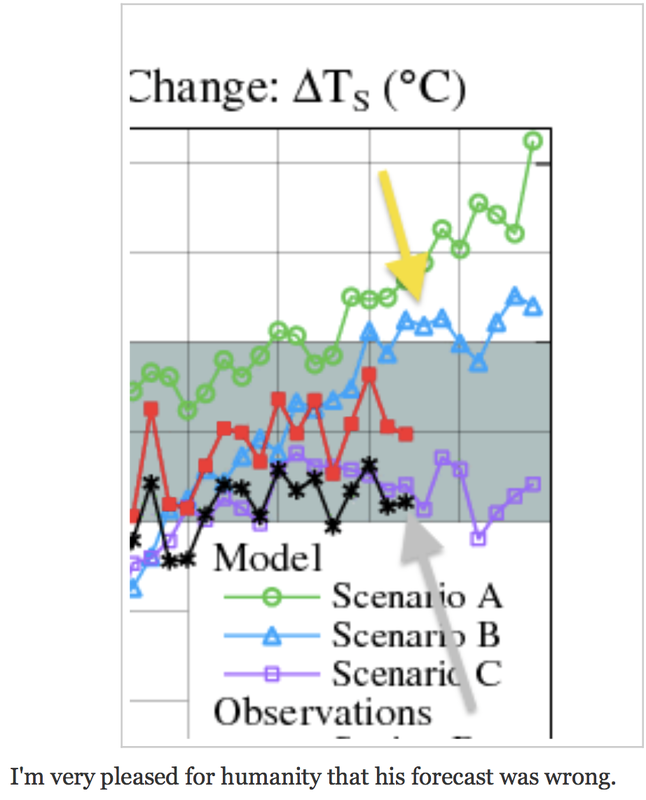 The yellow arrow points to the Scenario B (being generous toward Dr. Hansen, from reading his paper multiple times, I believe A is the better point of comparison, but that would make his forecast even worse) forecast temperature for earth. The actual temperatures are the black stars and line (gray arrow). Actual earth temperatures were far cooler than Dr. Hansen's forecast. In the screen capture you can see that I wrote, "I'm very pleased for humanity that his forecast was wrong." I was working on a different project yesterday and went back to the NASA original source. Instantly, my eyes registered something was off. That version is below. So, I asked my artist friend, Karen Ryno, to put the 2013 and 2016 versions (they are supposed to be the same up to 2012, data is added at the end of each year) side by side. It is below. While temperatures on both graphs are the same in 1999-2000, they have been raised since 2010. On the 2016 graph, the actual values for 2011 and 2012 are 0.2°C warmer (a large increase in an earth climate temperature). I suspect they made the January 20, 2016, change because Hansen's 1988 forecast was embarrassingly bad when compared with the actual temperature values. So, they substituted temperature numbers that were more, shall we say, convenient. I give credit for NASA pointing out their change. If you cannot read the small print at the bottom of the graph above, it says, "Update of Fig. 3(a) in Hansen, Global Climate Changes as Forecast by Goddard Institute for Space Studies Three-Dimensional Model, 1988, JGR and Fig. 2 in Hansen, et al., 2006, PNAS. (Updated on 2016/01/20, now with GHCN version 3.3.0 and ERSST v4)"
But, is raising the recent temperatures on a graph designed to validate a 1988 forecast scientifically valid? I say, emphatically, no! Here is an illustration of my point. The Fahrenheit temperature scale was proposed in 1724 and was the only temperature metric of that era. Suppose in 1725, a climate scientist said that, due to global cooling, the average high temperature March of the year 1750 in Berlin would be 12°. Let's say it turned out that March, 1750, was extremely warm, compared to the forecast, with an average high of 50°F. The climate scientist making the forecast (given what is apparently ethical in today's climate science) says, Wait a minute, I meant the March, 1750, forecast in degrees Celsius! My forecast of 12° nearly matched the Celsius high of 10°C! [the Celsius temperature scale was invented in 1744]. Here is another example: Suppose you made a Vegas sports book bet on the outcome of a Kansas City Chiefs - Denver Broncos game the day before it was played. Would the sports book allow you to change your wager at the end of the third quarter as the game was in progress? Of course not. A bet (a form of "forecast") is based on what was known to the parties at the time the bet was made. Here is a second example example of changing goalposts. 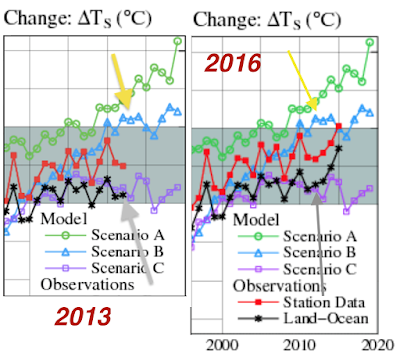 Over at Climate Audit, the invaluable Steve McIntyre has a case involving comparisons to climate computer models. 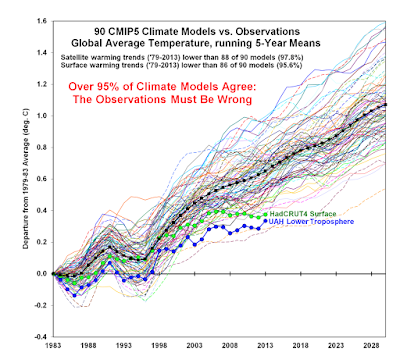 The issue in question began over at climate scientist Dr. Judy Curry's blog in a post titled, "Comparing Models with Observations." Judy was asking questions about various climate models and how they performed when compared to earth's actual temperatures when plotted on graphs. Just go over to the green link to see her comments and concerns...I'll wait. Are you back? Great! As you know, Judy asked this question about the sets of graphs purporting to show the same comparison. With regards to John Christy’s figure, he is the author of one of the main observational data sets used in the comparison. I don’t know the source of the time series that Gavin provided, but the observations in gavin’s figure vs Christy’s figure do not look similar in terms of time variation. I have no idea how to explain this. 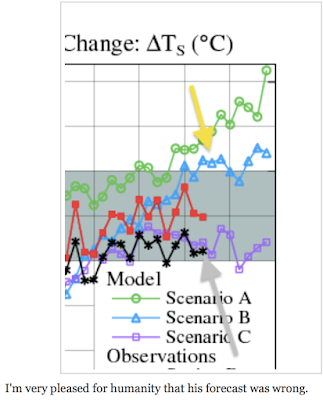 So, Steve McIntyre took up Judy's question and compared the effects of the different baselines used and found that it made a real difference as to how well the climate models fared (short answer: poorly). One of the figures originally in question is below and its author/original use is Dr. Roy Spencer, here. 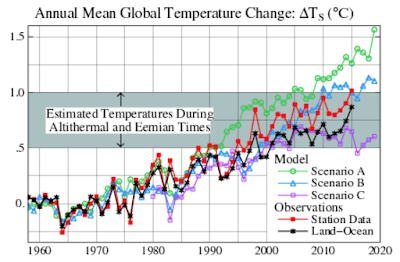 Dr. Spencer's point was that 90 climate model forecasts (the spaghetti-like lines) were way too warm (the mean of the forecasts is the thick black line) when compared to actual observations of the earth's temperature. The green observations are the British surface measurements (HadCRUT) and the blue observations are Spencer's satellite observations (UAH = University of Alabama, Huntsville). The Over 95% of the Climate Models Agree: The Observations [green and blue lines] Must Be Wrong is a sarcastic comment about the climate science culture of manipulating temperatures to make them agree with the hypothesis of a rapidly/catastrophically warming earth. I highly recommend reading McIntyre's entire analysis (blue link, above). I'd love to be able to tell you this is an exception to the rule in climate 'science' but it is not. Unlike [good] science, in climate science when the data does not agree with the hypothesis, sadly, it is the data that is changed.